This just in: squash collection!! As I mentioned in a previous post, we are developing a new path of collecting at the Watkinson, in honor of Trinity’s amazing success over more than a decade of playing squash. We acquired this 33-item collection from a Vermonter with a deep love of the game and its traditions and lore. It is our hope that some of the student athletes who play the sport will think of us the next time they have to do a paper, and learn a bit about the history of the sport in which they are participating, and to which they ultimately contribute. This concept of the labor involved, both physical and mental, in order to take part in a tradition, is essential to understand when you come to the Watkinson. We have, after all, over 5 miles of shelves holding a portion of the concentrated traditions of five centuries of human endeavor. Play the game so your mind and muscles may know it–come to the Watkinson to engage with these materials for a more sublime understanding of the game. Comments Off on This just in: squash collection!! The Watkinson during Reunion Week! During “reunion week” (the second week of June) this year there were several opportunities to see Watkinson rarities. On Wendesday the 6th about a dozen alumni attended a presentation entitled “John James Audubon: American Dreamer.” Born in Haiti, educated in France, and sent to America to avoid the draft (i.e. Napoleon’s conscripted legions), Audubon is an early example of American self-fashioning. Works by Audubon, as well as his contemporaries Alexander Wilson and Prideaux John Selby, and his fore-runner Mark Catesby, were out on display for folks to view. On Friday a crowd of some 40-50 people (mostly Class of ’57) enjoyed a screening of David Elliott’s award-winning film The Curious Mr. Catesby (2007). Mr. Elliott (’57) is the Executive Director of the Catesby Commemorative Trust. I brought out the Watkinson’s copy of the first edition of Catesby’s Natural History of Carolina, Florida and the Bahama Islands (1731-43) and showed it to an appreciative crowd. Trinity was able to purchase this copy in 1883 through the generosity of a “rich uncle” of a Trinity alumnus (George Lewis Cooke, class of 1870). The next day a steady stream of visitors were able to view the “bird of the week” from John James Audubon’s Birds of America set, which has been at Trinity for 112 years, as well as the newly acquired 2nd Folio of Shakespeare. At 1:30, with the help of Watkinson Trustee Jack Enders (’92), I presented a selection of recent acquisitions of ornithology material for the Enders collection, given by his grandfather, Ostrom Enders in the 1980s. Comments Off on The Watkinson during Reunion Week! “It is generally agreeable to be in the company of individuals who are naturally animated and pleasant. For this reason, nothing can be more gratifying than the society of Woodpeckers in the forests . . .
No sooner has spring called them to the pleasant duty of making love, as it is called, than their voice . . . is heard from the tops of high decayed trees, proclaiming with delight the opening of the welcome season. Their note at this period is merriment itself, as it imitates a prolonged and jovial laugh, heard at a considerable distance. Several males pursue a female, reach her, and, to prove the force and truth of their love, bow their heads, spread their tail[s], and move sideways, backwards and forwards, performing such antics, as might induce anyone witnessing them, if not of a most morose temper, to join his laugh to theirs. The female flies to another tree, where she is closely followed by one, two, or even half a dozen of these gay suitors, and where again the same ceremonies are gone through. No fightings occur, no jealousies seem to exist among these beaux, until a marked preference is shewn to some individual, when the rejected proceed in search of another female. 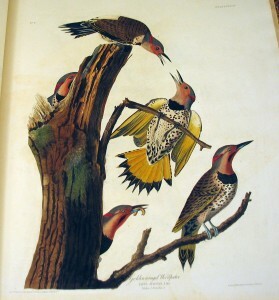 In this manner all Golden-winged Woodpeckers are soon happily mated. Each pair immediately proceed to excavate the trunk of a tree, and finish a hole in it sufficient to contain themselves and their young. They both work with great industry and apparent pleasure. Should the male, for instance, be employed, the female is close to him, and congratulates him on the removal of every chip which his bill sends through the air. While he rests, he appears to be speaking to her on the most tender subjects, and when fatigued, is at once assisted by her. In this manner, by the alternate exertions of each, the hole is dug and finished. They caress each other on the branches, chase all their cousins the Red-heads, defy the Purple Grackles to enter their nest, feed plentifully on ants, beetles and larvae, cackling at intervals, and ere two weeks have elapsed, the female lays either four or six eggs, the whiteness and transparency of which are doubtless the delight of her heart . . .
–J. 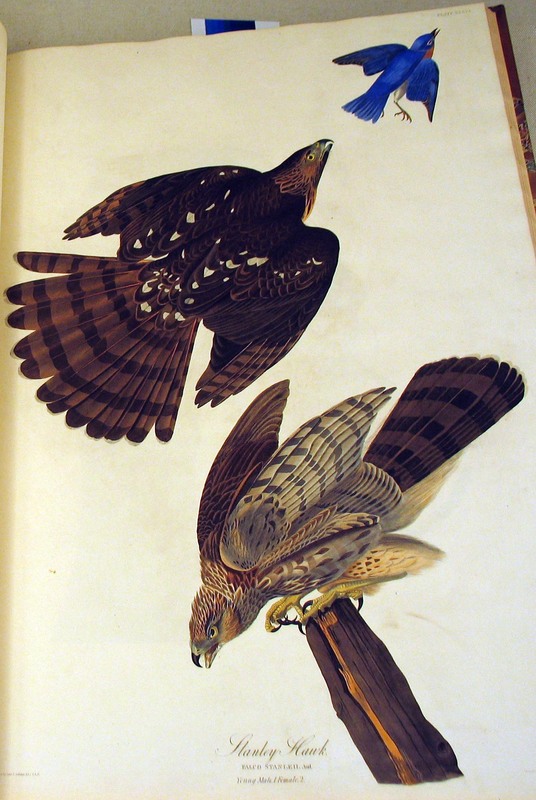 J. Audubon, Ornithological Biography, I (1831), 191-194 [excerpted]. “On the 5th of December 1809, I made a drawing of the male of this species, in its matured state of colouring, at Louisville, in Kentucky, where I then resided . . . [I offer here, however] to your inspection a male, probably two years old, and an adult female . . . I have honoured the species with the name of the President of the Linnean Society of London, the Right Honourable Lord Stanley, a nobleman whose continued kindness to me I am happy in acknowledging . . .
–J. J. Audubon, Ornithological Biography, I (1831), 186-188 [excerpted]. You are currently browsing the The Bibliophile's Lair blog archives for June, 2012.